Fancy winning yourself one of these? I have collaborated with wholesome bling watches so that one lucky reader can win a watch of there choice. These are 4 of my favourite watches, of course there are other patterns and sizes. Take a look at my wholesome bling post where you can see my review of the watch i received and how it looks on. 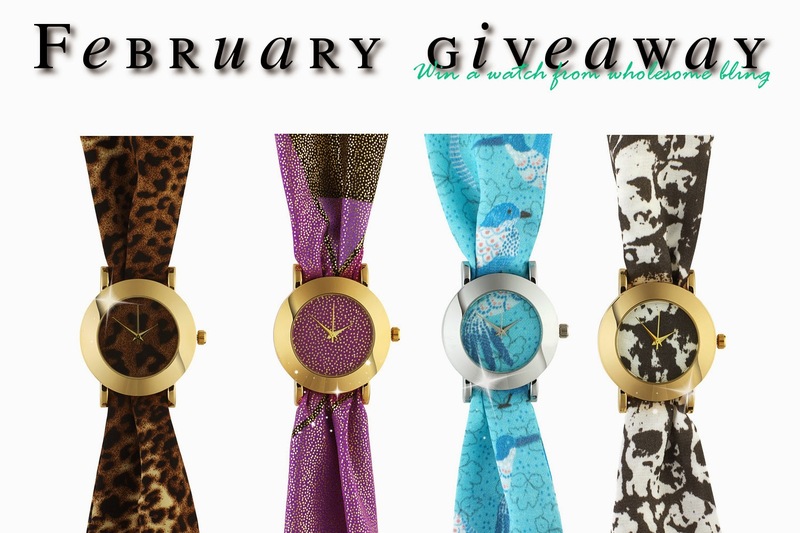 Fancy winning a brand new watch in February? Please read the rules and instructions on how to enter below. The more entries you have, the better chance you have of winning. I check all entries so if there is no evidence of you liking or following what you submitted entry for, you will be withdrawn from the competition. The giveaway will begin on the 2nd of February 14 and will end on the 16th of February 14. The winner will be selected randomly by rafflecopter and will be contacted within 3 days of the giveaway ending. However, if the winner does not respond within a week of contact, another winner will be chosen. Nice watches! Good luck with the giveaway!!! These watches are very pretty! Thank you very much for visiting my blog! Have a lovely week! Thank you for the great giveaway ! Ces montres sont superbes ! Merci pour cet excellent giveaway ! Lovely watches :) Thanks for hosting this giveaway!